Robbie Giroir, who was director of music and the organist at St. Joseph Cathedral in Baton Rouge for more than 30 years, left a legacy through his music and teaching, “famous one-liners,” time in the sky as a pilot and collection of historical and nostalgic memorabilia. After he died of a brief illness at age 59 on Dec. 23, more than 1,200 people attended his funeral Mass on Dec. 27, which featured several choirs, ensembles and prominent musicians. Giroir’s indelible print has been left on his students, many of whom have traveled the world and excelled in their own musical careers. 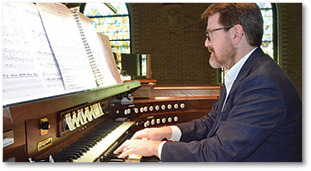 Former student Christopher Berry, professor of organ and organist at Carthage College in Kenosha, Wisconsin, returned to present a recital in memory of Giroir at the cathedral on March 28. Berry, born and raised in Baton Rouge and an alumnus of Catholic High School, started studying the organ at age 13. He said he was on “cloud nine” </span id=”3″>when Giroir, who had a reputation of excellence as a teacher, took him as a student in the 1990s after an audition. “I remember his sayings. He was brilliant and really quick with one-liners. They could sometimes be scathing,” said Berry. He remembers playing a piece in the cathedral choir loft and Giroir was down in the church listening to him. “He came running up the stairs and said, ‘What are you doing, trying to kill cockroaches?’ ” Berry mused. Giroir then instructed Berry on the correct way to play the organ pedals rather than stomp on them. Berry wears ballroom shoes, which have a thinner sole than dress shoes, to get “the feel” of the organ pedals. Even through his corrections, Berry didn’t lose heart, because he knew that Giroir had high expectations and would not take on a student unless he recognized talent and potential in them. Berry said Giroir was always supportive and offered critiques to help the students be the best they can be. Berry said he was also privileged to be around the cathedral when its icon organ, Providence, was installed in 1992. He said Giroir “walked on air” as the electronics and piping were installed. 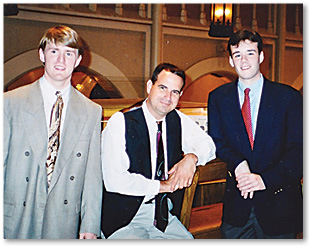 When Berry was in high school, Giroir asked him to be his assistant organist, which meant playing for Saturday vigil Masses and assisting at other large cathedral events, including the funeral of Bishop Stanley J. Ott. And Berry has taken many valuable lessons from Giroir through his musical career. Berry is also director of music and organist at the basilica of St. Josaphat in Milwaukee, Wisconsin. His church positions have also included the Basilica of the National Shrine of the Immaculate Conception in Washington, D.C. and the Pontifical North American College in Vatican City. He has played recitals and accompanies choirs throughout Europe and America. Giroir has been to Berry’s concerts through the years. Berry said it was also through Giroir’s tutelage that he won a prestigious award from the Conservatoire de Rueil-Malmaison in France. “I learned (to play) ‘Pièce Héroïque’ with Robbie,” he said. “Years later, when preparing for the final exam at the conservatory, a piece was assigned to us on short notice that had to be played from memory in order to obtain the Premier Prix, or first prize. To my great joy, and relief, this was the piece I was assigned. I had learned it so well that memorizing it on short notice was no problem. He attended Giroir’s funeral and met David Summers, primary substitute organist at St. Joseph. Summers and Berry came from different eras of Giroir’s students (Summers studied under Giroir from 2011-2015). However, as they talked they found much that remained the same about Giroir, such as his quotes, eccentricities and “brand of music” that was distinct, which is what drew them to him. Summers remembers Giroir would say, “Don’t come with a default setting” and was amazed at Giroir’s ability to improvise when playing the same musical selections for three to four weekend Masses. It wasn’t long after Berry and Summers talked that the memorial concert was planned. Berry’s concert featured congregational hymns, which Giroir considered “the pinnacle of music” and most sacred. And Giroir’s personality shone through in the concert.